THE NAME KALAHARI is derived from the Tswana word Kgalagadi, meaning “the great thirst.” The Kalahari Desert, an arid region on the interior plateau of southern Africa, covers area in central and southwestern BOTSWANA, parts of west-central SOUTH AFRICA and eastern NAMIBIA, encompassing an area of about 100,000 square mi (260,000 square km). The Kalahari Desert is part of a larger sand basin that extends into ANGOLA and ZAMBIA in the north, through Botswana into ZIMBABWE in the east, to the Orange River in South Africa, and west to the highlands of Namibia. The Kalahari is mostly flat, with an average elevation of about 3,000 ft (1,000 m) above sea level. The sands of the Kalahari are red, brown, or white by region. Parallel dunes run north to south or northwest to southeast, depending on the winds and cover large areas of the Kalahari. The dunes vary in height from about 20 (6 m) to 200 ft (60 m) are up to 50 mi (80 km) long, and are separated by chasms of varying width. 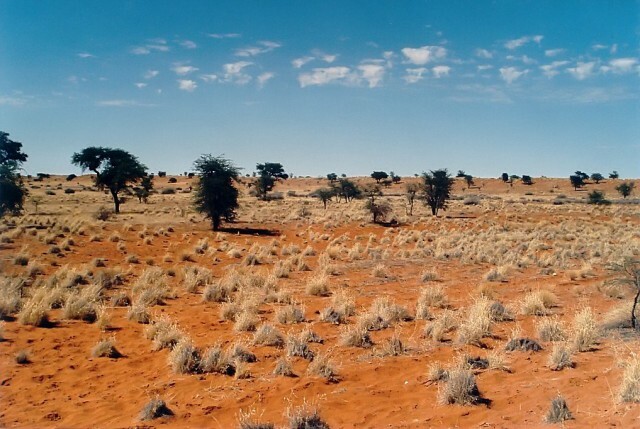 The Kalahari has a semiarid climate with frequent droughts. The region receives about 8 in (20 cm) of precipitation a year, mainly between the months of October and May. The rainfall pattern is unpredictable, and precipitation can vary by more than 100 percent between years. The rains generally come in the summer months, September to March, as thunderstorms. Daytime temperatures range between 95 to 113 degrees F (35 to 45 degrees C) from October to March, which are the hottest months, and can drop below freezing between June and August. Temperatures ranges in the Kalahari Desert are some of the highest and lowest in southern Africa. The daily temperature ranges are also large. and the Boteti carries the overflow east into Lake Xau and the Makgadikgadi Pan on the northeastern fringe of the desert. During the rainy seasons systems of streams and rivers flow temporarily. Water can be found below ground in the temporary waterways that flow into depressions in the desert, known as pans. Pans vary in size from a few meters to tens of kilometers in diameter and provide temporary sources of surface water. After heavy rain, these become pans or lakes, and water is then also found in mud-bottomed pools along the beds of the rivers. Pans also occur in craterlike depressions where rock rises above the desert sands. Tough sun-bleached grasses grow in patches on the sand dunes. Other plant life consists of scrub bushes, patches of forest with fine leaf trees. The most amazing plant found in the Kalahari is the watermelon. There are both the bitter and sweet varieties. Wildlife includes the lion, leopard, hippopotamus, rhinoceros, buffalo, zebra, several kinds of antelope and gazelle, baboon, ostrich, spotted and brown hyena, wildebeest, elephant, giraffe, and eland. The hunting of these three last animals is prohibited, and for all game there are strictly enforced hunting seasons. Most animals are migratory, moving seasonally between sources of available water during the rainy season in summer.